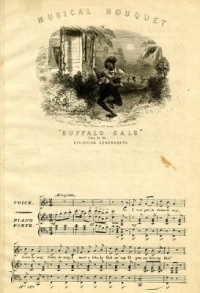 This page Sheet music is part of the music series. Sheet music is a hand-written or printed form of musical notation; like its analogs -- books, pamphlets, etc. -- the medium of sheet music typically is paper (or, in earlier times, parchment), although the access to musical notation in recent years includes also presentation on computer screens. Use of the term "sheet" is intended to differentiate music on paper from an audio presentation, which would ensue from a sound recording, broadcast, or live performance, which may involve video as well. In everyday use, "sheet music" (or simply "music") can refer to the print publication of commercial music in conjunction with the release of a new film, show, record album, or other special or popular event which involves music. Unless indicated otherwise, the text in this article is either based on Wikipedia article "Sheet music" or another language Wikipedia page thereof used under the terms of the GNU Free Documentation License; or on original research by Jahsonic and friends. See Art and Popular Culture's copyright notice. This page was last modified 13:01, 9 April 2013.